A recent article in the New York Times profiles a range of innovative ways that hotels are integrating local and on-site food production as attractions to draw in guests and enrich their experience. From roof-top vegetable gardens to bee-keeping, goats, curing meats and homemade wine, the hotels featured fully explore the relationship between local food production and hospitality. While many hotels and inns, especially in more rural areas, have long had kitchen gardens (such as the luxurious Le Manoir), the hotels featured here are unusual for being urban hotels that make more of the produce than just an ingredient. Some of the more intriguing strategies include the Elysian Hotel in Chicago that not only serves a local farm-based menu created around available produce, but also leases land at the Heritage Prairie Farm to grow specialty vegetables and keep bees. Such a partnership benefits the hotel (chefs and bartenders request heirloom vegetables for signature menu items) but also, presumably, the farm which has a guaranteed income from the hotel while keeping the land in production. In this way the hotel's buying practices become a form of activism that conserves working farmlands near urban areas. Another partnership worth noting also takes place in Chicago, where the Marriott Downtown uses honey from their rooftop hives to create a special beer, made in partnership with a local brewer. Again, while the hotel gets a unique item to market, the brewery might benefit from a dedicated revenue stream. Noting a trend towards hotels with working gardens and apiaries, Bjorn Hanson, dean of the Tisch Center for Hospitality summarizes: "It creates a positive image, and people will pay a premium for it." The lost opportunity, based on the article's description of these gardens, is the chance for guests to fully interact with the gardens, to gain a landscape perspective on productive gardens. The strategies generally encompass marketing to a passive consumer, through a descriptor on the menu, but rarely seem to suggest a direct interaction between guest and garden, or diner and dinner. For example, I imagine the Marriott's brew, Rooftop Honey Wheat Beer, might taste best if quaffed in the rooftop garden, surrounded by the humming of the bees themselves. A beautiful example of designed agriculture is the Omm Hotel in Barcelona, whose kitchen garden is the center point of the hotel courtyard, affording view and interaction between the garden and guests. The opportunities abound for engineering encounters between the guests and their food in the landscape - a breakfast orangerie where fruit is freshly plucked for juice, courtyard gardens planted in orchards of nuts and fruits, herbal lawns at the spa, a poolside planted with date palms. I'm hoping more hotels keep the kitchen garden front and center, integrating the productive landscape into the leisure landscape. 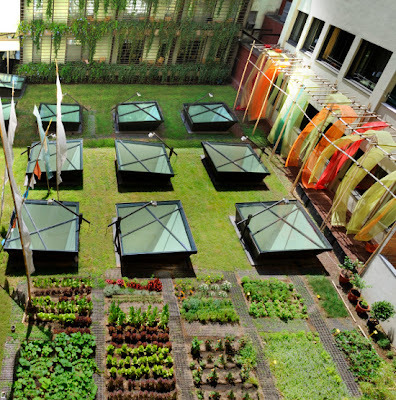 Do you know hotels with beautiful and accessible potagers? Leave a comment, I'd love to hear about them.